Welcome to the 25th annual ROCKY MOUNTAIN MUSTANG ROUNDUP! Twenty-five years, there have been car makes that did not last that long! As the years have passed the ROCKY MOUNTAIN MUSTANG ROUNDUP has improved and this year is no exception. This year we have added the opportunity for 1964 ½ to 1978 Mustangs to be judged by Mustang Club of America judges. Also new this year is our updated web site. If you haven’t checked it out be sure and do so. A question that always seems to come up is “Does my Mustang belong in the modified class?” We have added some guidelines to help with decision in the FAQ section on the web page. Please look at it if you have a question about that or other FAQ’s, any ROCKY MOUNTAIN MUSTANG ROUNDUP committee member can either answer your question or get you in touch with a person who can. 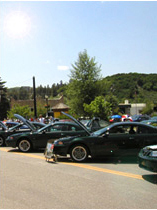 As in the past the city of Steamboat will be providing volunteers to judge the Show and Shine. They will be working independent from the MCA judges. The Steamboat judges will judge all entries even if the MCA judges are judging them. Just because you did not select the option to have your Mustang judged by the MCA judges does not mean that it does not have an equal chance of getting an ROCKY MOUNTAIN MUSTANG ROUNDUP award. The ROCKY MOUNTAIN MUSTANG ROUNDUP is about having fun with our cars. The Show n’ Shine is just one way we can do this. Please remember that the Show n’ Shine judges are volunteers and may not necessarily be an expert on Mustangs. Here are the guidelines the judges are given to judge your cars. Cleanliness:	Does the car appear neat and clean? Craftsmanship: Does the car show a high standard of restoration/workmanship? Quality: Does the car show extensive attention to detail? Each category is worth 5 points for a maximum of 25 points. We encourage you to leave the hood, windows, and trunk open, as extra points will given for cars with those areas detailed. Extra consideration may be given to those cars, which participate, in the scenic tour and/or the autocross. Judges will be looking at your Mustang but they are instructed to do just that. Look. Our goal is to organize a fair and fun competition. We will do our best to meet that end; however, all judging decisions will be final. The results of the Show n’ Shine judging will not be made public. The ROCKY MOUNTAIN MUSTANG ROUNDUP committee wants to make this the best event possible so that you have a fun weekend to remember. We ask that if you have any concerns, questions, or most of all suggestions please let us know. We will do our best to resolve any problems about the event that come up. I will be manning the judge’s table in case anyone needs assistance show day at 8th and Lincoln Street. I hope you have as much fun as I do at the ROCKY MOUNTAIN MUSTANG ROUNDUP. I look forward to seeing you again next year and please tell your fellow Mustangers about our show!